Looking west near Half Hollows Road (now Colonial Springs Road) in Wyandanch and Wheatley Heights. Farmingdale can be seen in the background. The aerial was dated February 3, 1930. -The distinctive circular road of the Pinelawn Cemetery which became the Long Island National Cemetery in 1936. The Long Island Railroad split the Mystery Foto down the middle. 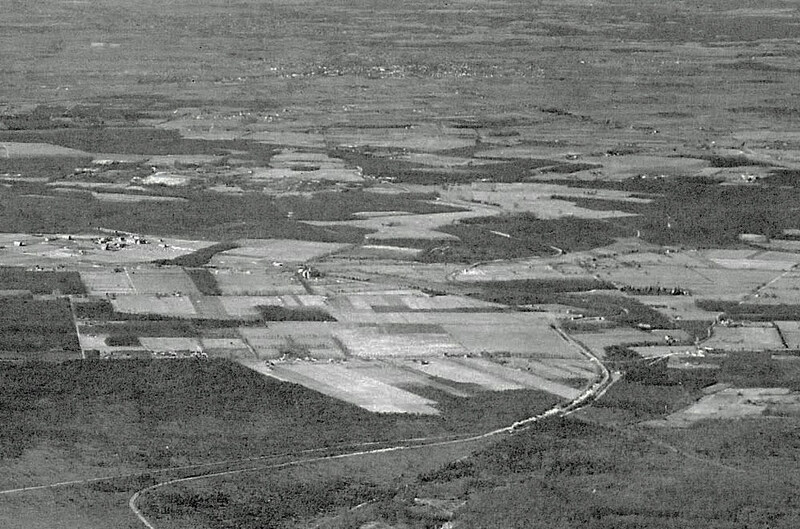 -Fairchild Flying Field in East Farmingdale, later to become Republic Aviation in 1939. 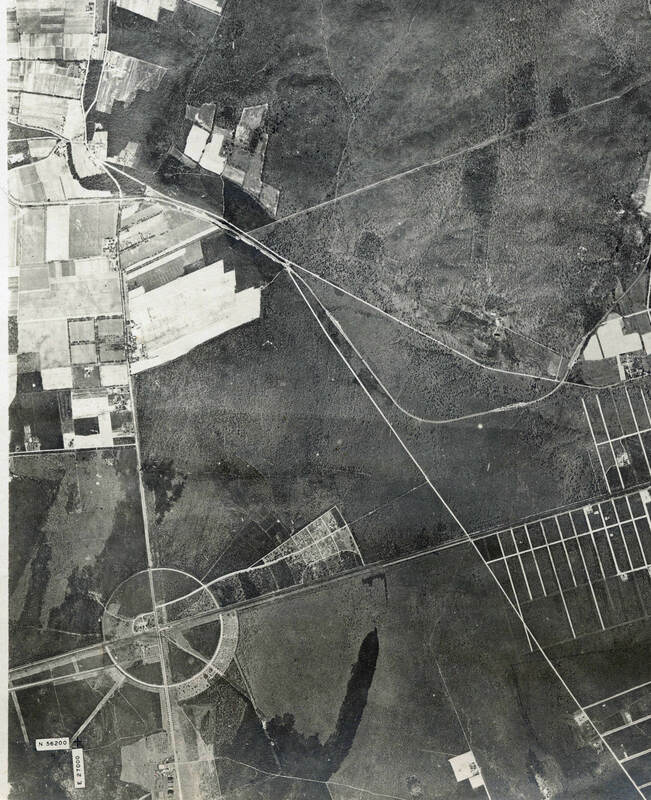 It is likely this Mystery Foto was taken from a Fairchild airplane which left this airfield. Congrats to Joe Osterle, Tim Ivers, Greg O., Art Kleiner, Steve Lucas, David Kilkenny, Brian McCarthy, Frank Mendyk, Al Velocci and Frank Femenias for correctly identifying the Mystery Foto. Kudos to my favorite co-author Al Velocci for the below details concerning the property acquistion by the Motor Parkway from the Brooklyn Diocese. A repeat of the April 22, 2013 Mystery Foto! Submitted by Tim Ivers and Greg O. 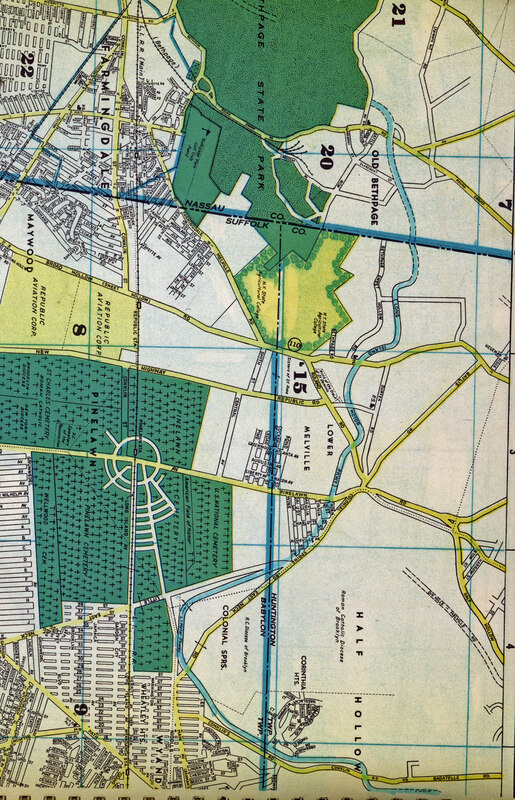 1952 map matching the orientation of the Mystery Foto. "This photo was taken with a small box camera. 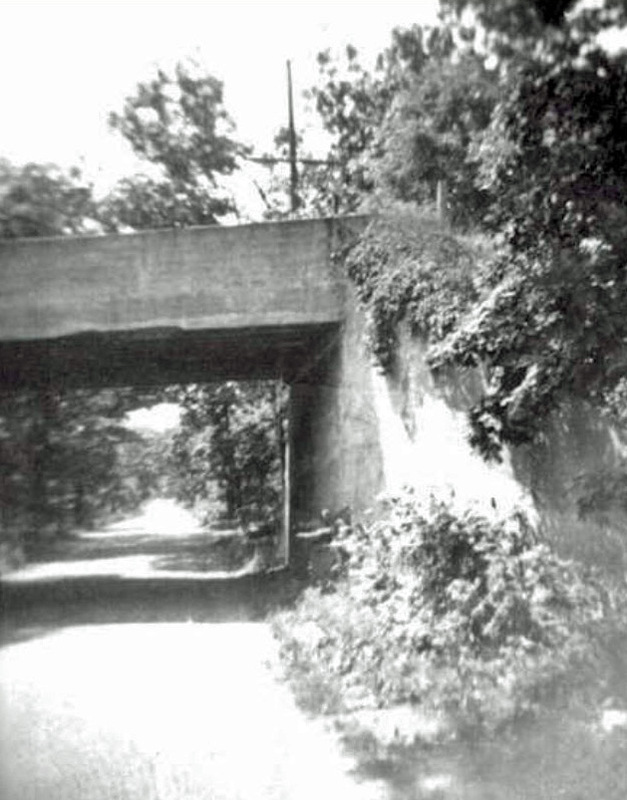 Bridge is over Colonial Springs Road and taken in the very early 1950s. I spent summers at my aunt's in Wyandanch and we rode bicycles on the Motor Parkway from Pinelawn Road to Half Hollow Road. Wide open, very few homes and no Long Island Expressway. The Motor Parkway was then in excellent shape." 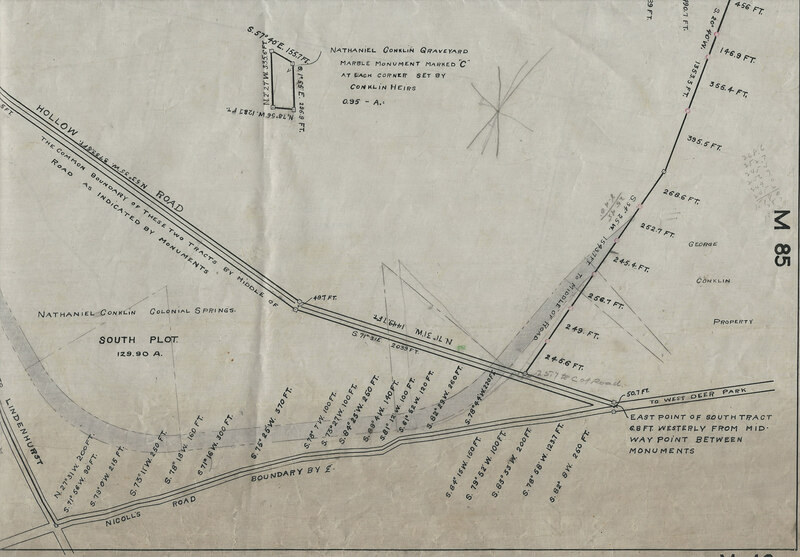 October 28, 1907 survey of the Motor Parkway property conveyed from RT.Rev. Charles E. McDonnell. Bishop of Brooklyn. 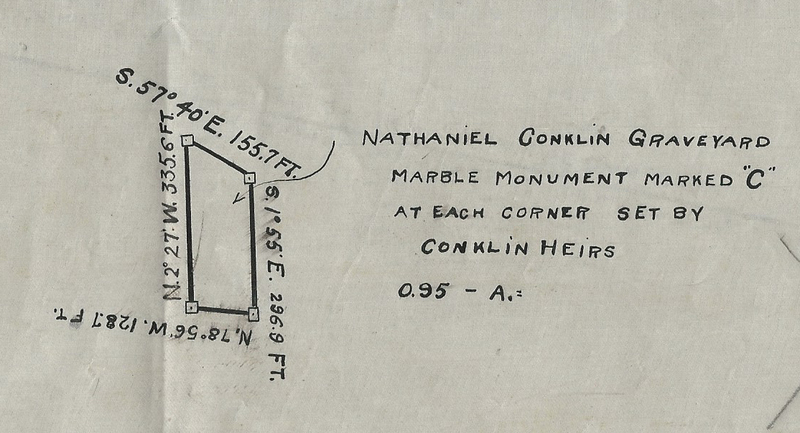 The survey indicated the gravesite of Nathaniel Conklin, who named Babylon in 1803. Picture faces west. The dominant center east/west passage is the LIRR. The LIMP comes into the picture heading SW over Bagatelle Rd and we see the LIMP bridge cross over Colonial Springs Rd. It swings west, and passes over Pinelawn Ave and into the current day Newsday property. Republic, the LIRR, Farmingdale State College visible. Recognized this one as a previous mystery photo from April 22, 2013 and was able to ‘borrow’ those answers - Wow! We’ve been guessing mystery photos for a long time! And even some Old Bethpage and Bethpage bridges in the background. Greg & Dee, Frank Femenias, Brian McCarthy and Steve Lucas - thanks guys for the leg work on this one. 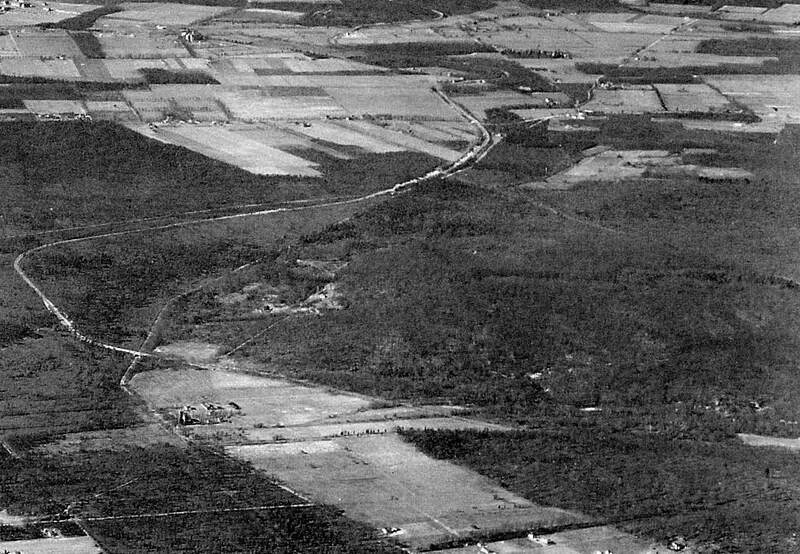 Photo is a 1930 aerial of the Motor Parkway near Colonial Springs Road in Wheatley Heights looking west. -And even some Old Bethpage and Bethpage bridges in the background. 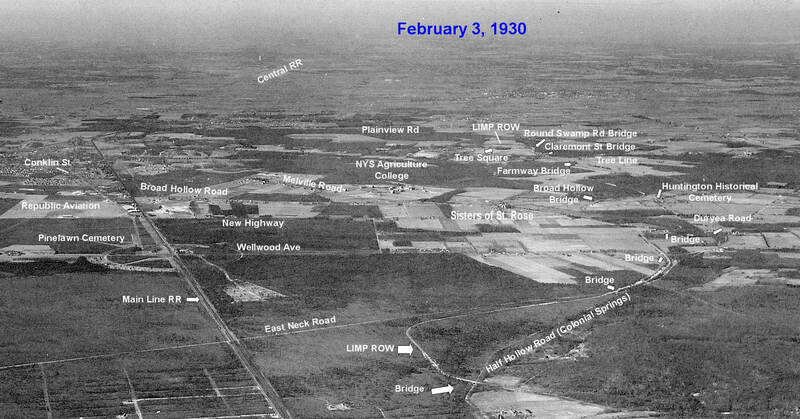 Airport is Fairchild Flying Field in East Farmingdale, later to become Republic Aviation in 1939. Pinelawn Cemetery. Major roads - Conklin Avenue, East Little Neck Road, East Neck Road (Colonial Springs Road), Pinelawn Road. I think we’re looking west over the Wyandanch - Wheatley Heights - Half Hollows area with the LIRR Main Line running through the middle. Parkway bridges include those over Colonial Springs Road, Little East Neck Road, Pinelawn Road. 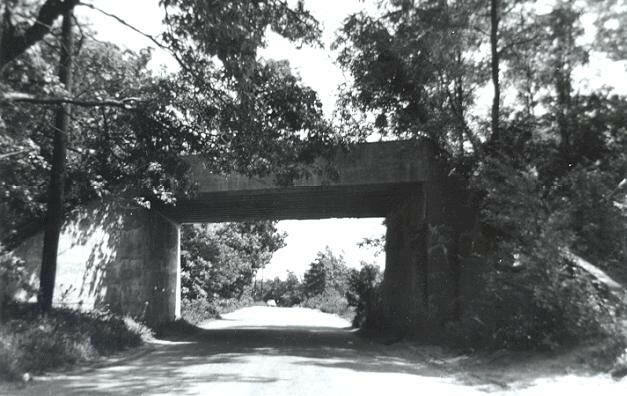 Ruland Road, Broad Hollow Road, (the major roads at the time) and the Baker farmway / Maxess Road bridge. Pinelawn Cemetery and Fairchild Flying Field can also be seen. I’ll guess the photo was taken around 1930. As I was reading the post with my mouse hovering over the images I noticed the URLs and the names of the pictures. Reading these names took all the challenge out of the exercise. So this is looking east in Suffolk County. You can make out the Half Hollow Rd Bridge along with Wellwood Ave and Little East Neck Bridges. I know there has to be at least 2-3 more but its tough to make out. You can also see Pinelawn Cemetary along with Republic Airport and LIRR Main Line. Major roads include East Neck, Half Hollow, Wellwood and New Highway to name a few. As far as timing, I would guess late 20’s early 30’s. Location/Orientation/Year? Bird’s Eye View of Wyandanch, Wheately Heights, Farmingdale, and Melville. Looking west, early 1930"s.
Visible LIMP bridges? East to West…Half Hollows, Little East Neck Rd Parkway type. Wellwood Ave, Ruland Rd Parkway Type. Not visible, but known…Ezekiel Smith Farmway type and Broadhollow Rd Pkwy/Trolley type. The photo is taken over Wyandanch facing basically west towards Farmingdale/Melville with Bethpage in the background. The photo was taken on 2/03/30. The following LIMP bridges can be clearly observed in the photo - Half Hollow Rd, Little East Neck Rd, Wellwood Ave, and Ruland Rd. If you blow up the photo you can observe the LIMP wandering all the way back to Bethpage. You can further observe the Maxess farmway, Broadhollow Rd, Old Bethpage, Claremont and Round Swamp bridges. The major roads which can be clearly observed in the photo are, Straight Path, Grand Blvd, Acorn St, Half Hollows Rd(Colonial Springs Rd), Wellwood Ave, and the LIRR mainline. Republic Airport which opened in 1928 and Pinelawn Memorial Cemetery can be seen in the photo. 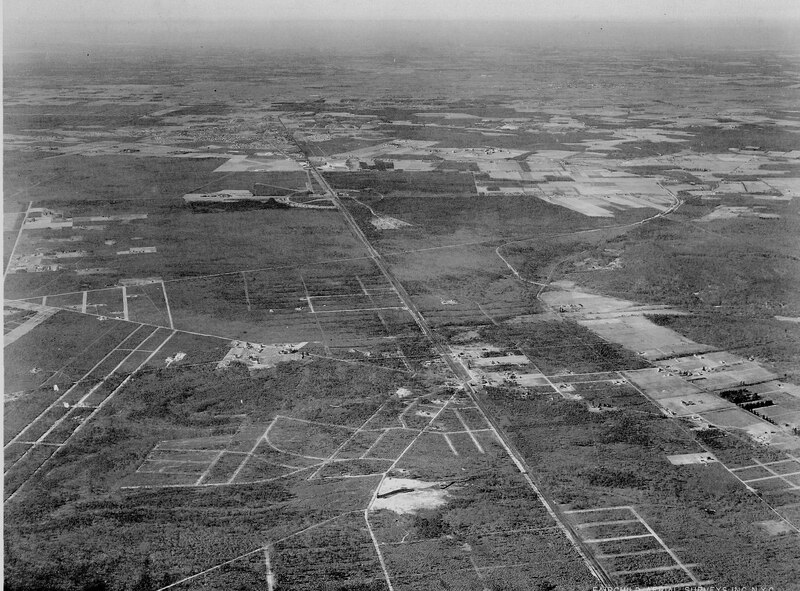 A super stretching aerial with Wyandanch/Wheatley Heights in the foreground looking West, mid to late ‘20s. I believe I see the circular path SW of the Motor Pkwy encircling Wellwood Ave, the future site for Pinelawn Memorial Cemetery, Long Island National Cemetery, and Colonial Springs Golf Club. The straight LIRR running east-west and slightly diagonal in the center. Republic Airport? (Fairchild Flying field, 1927) later to come. I don’t see it in the aerial but someone will surprise me I’m sure. Al- Thanks for additional info! Once again you always provide that little extra tidbit that’s fascinating! Thanks Al, great to learn about events and compromises surrounding the construction of the parkway. Acquiring land must’ve been their greatest obstacle based on the parkway’s jagged line throughout its 44 miles. Even the Lincoln Hwy ran straighter for most of its stretch.